The TV ads and trailers for The American, George Clooney’s latest effort in front of the camera, suggests moviegoers are in for a Bourne-style action-thriller, albeit with an older, greyer version going through the genre’s paces. That’s not, however, what Clooney and his director, Anton Corbijn (Control), deliver. Closer in tone and style to Jim Jarmusch’s last film, The Limits of Control, but less abstract and oblique, The American is a pared-down, slow burn, non-cautionary tale about an aging hitman at a moral and spiritual crossroads. 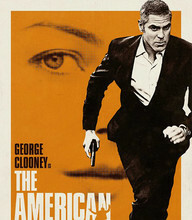 Adapted by Rowan Joffe from Martin Booth’s 1990 novel, A Very Private Gentleman, The American focuses on a world-weary, aging hitman (Clooney). He’s alternately called Jack or Edward (his real name could be either or neither), but he’s a man without a past and, possibly, a man without a future. Despite a lifetime of killing for money, Jack retains a shred of humanity. It’s not exactly plausible, but that’s where the suspension of disbelief, arguably stretched to its limits, kicks in. Jack’s softhearted turn makes him a liability in the eyes of his handler, Pavel (Johan Leysen), but, despite Jack’s growing mistrust, they continue to work together. After Jack survives an ambush in Sweden, he warily retreats to Italy. Ever vigilant, Jack refuses to carry a cell phone or stay in the small rustic village Pavel suggests. Jack finds himself in another neighboring village where he befriends an elderly priest, Father Benedetto (Paolo Bonacelli), and begins a tentative romantic relationship with a prostitute, Clara (Violante Placido). Pavel gives Jack the proverbial “last job,” building a long-range modified rifle for another assassin, Mathilde (Thekla Reuten), every bit as good as Jack at their chosen profession. As The American casually wends its way toward its predictably disappointing denouement, Corbijn focuses primarily on the mundane — the moments between and leading up to the choreographed gunplay that closes the film — including multiple scenes of Jack, equally adept at creating weapons as he is wielding them, working intently at a table while he creates a weapon to Mathilde’s specifications. Corbijn constructs each scene with remarkable precision, thankfully eschewing handheld camerawork for a pre-1980s approach where the camera centers on the action and scenes are constructed around editing, not camera movement. In a scene that practically invites post-screening discussion, Corbijn references Sergio Leone’s Once Upon a Time in the West, the epitome of the “art” Western (i.e., the unique mix of European art cinema conventions with the American Western). It offers both an important clue to Corbijn’s rigorous, methodical approach to The American while also suggesting parallels between Corbijn and Leone’s films. But visual style, no matter how engaging or engrossing, does little to hide the overly familiar, clichéd story and character turns found in Joffe’s screenplay. The weak material is made all the more obvious by the inclusion several scenes of a shirtless Clooney showing off his physique. He’s undoubtedly fit for a man pushing fifty, but given his public persona as well as his involvement as a producer on The American, those scenes seem self-indulgent, narcissistic, and unnecessary.